David, the owner started out as an aircraft mechanic on piston-driven aircraft while in the US Navy. After the service David got a letter from two companies the very same day offering him a job. One company was with McDonnald Douglas Aircraft in St. Louis and the other was with Spector Freight Systems. Spector paid more money so David choose them. Hence the beginning of Davids professional career. After a year with Spector David was laid off and went to a Chevrolet dealership as a mechanic. From there, off to another trucking company as a diesel mechanic. David overhauled transmissions, motors, differentials and still did freelance work on the side. Even as a young adult he had a strong interest in mechanical things. As the trucking industry slowed down in Akron, Ohio David was able to build up the freelance work into a full time business. In 1984 he opened DAS Auto Service on Geneva Avenue in Tallmadge, Ohio. In 1987 his son Vince joined him in the daily operation as a mechanic. Vince has worked with David ever since he has graduated high school. 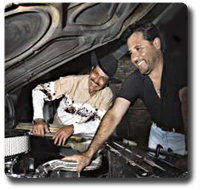 Between just the two of them, they have been involved in the automotive repair business for over 80 years. To meet or exceed our customers expectations in both customer service and professional repairs. Over the years we have become known for our electrical diagnostics, troubleshooting and differential repairs and rebuilding. We are also a full service auto repair shop which includes air conditioning service, brakes, tune-ups, suspension, steering and more.